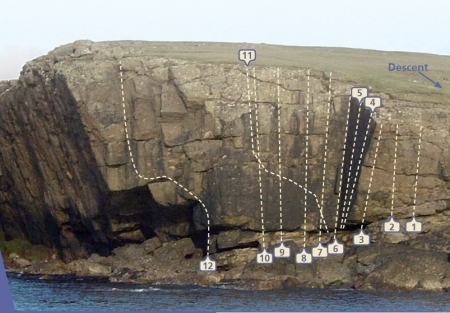 This venue, which was previously of little interest to climbers due to its lack of adequate protection, became Shetland’s first sports crag. It offers varied climbing on good rock, just 5 minutes from the road and is a brilliant option for a summers evening as it catches the evening sun. The original routes were bolted in 2007 by local climbers and belays are in place at the top of the climbs (no lower offs). There are also belays situated further back from the cliff in exposed bedrock allowing self belaying at the crag or for abseils back down. The crag is sheltered and the first 3 routes are non-tidal but the others require a low tide and a calm sea to guarentee access, though it tends to be fine. It is likely that more routes will be added to the crag shortly. The 2 original climbs at the crag, climbed in 2003 have been left unbolted and require a small trad rack. Both are well protected and good first trad leads. There is also a small bouldeing traverse wall on the beach to the West of the crag. The whole traverse is around V6 but easier variants can be done. The landing is mostly sand so mats are not needed. In Eshaness, beyond the Braewick cafe and caravan site, take the Leascole road and follow this over the cattle grid and to the croft at the bottom of the road. Park here, taking care not to block any gates or the turning area. Walk through the pedestrian gate next to the walled garden, over the stile on the left and North over the brow continuing alongside the fence, eventually crossing a stream on metal planks. The crag is now clearly visible in front of you. To add a photo use the uploader in the right sidebar. Make sure you put Raasmi (exactly) in the description.